The Mercedes-Benz SLC 300 is equipped with the ECO stop and start system. This system is designed for ultimate fuel economy. At a stop sign, the engine will shut off. When you take your foot off of the brake, the engine restarts, and you are on your way down the road. The driver can shut this system off for more control. 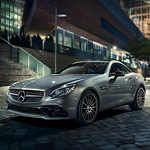 The Mercedes-Benz SLC 300 also provides ultimate driver control. This vehicle has a standard 9G-TRONIC automatic transmission that provides smooth and efficient shifting. You can also shift on your own using the paddle shifters that are mounted on this vehicle's steering wheel.